Looking for the best FTPS, SCP, or SFTP server for your file transfer needs? Learn how GoAnywhere MFT can help you achieve your file transfer goals with secure FTP clients and servers for Windows, Linux, IBM i, and other platforms. Why Use Secure FTP Software? GoAnywhere MFT implements a secure FTP solution to protect sensitive file transfers with strong encryption and authentication methods. 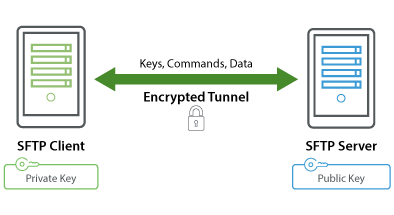 GoAnywhere's support for the three secure FTP standards (SFTP, FTPS and SCP) creates encrypted tunnels between client and server systems. Download a free trial. Related Reading: What are the differences between SFTP vs FTPS? Detailed audit logs are required for maintaining compliance with regulations and privacy laws. Unlike other secure FTP solutions, GoAnywhere MFT tracks all Secure FTP file transfer activity in a central database, which can be viewed in the dashboard or automatically distributed in PDF format. A wide variety of management and analytical reports are available. Filter Results based on date ranges, specific users, severity, etc. "GoAnywhere allowed us to eliminate and reduce the need for custom programming to transfer files and database records between dissimilar database management systems. We found GoAnywhere to be highly intuitive, flexible and easy to use." 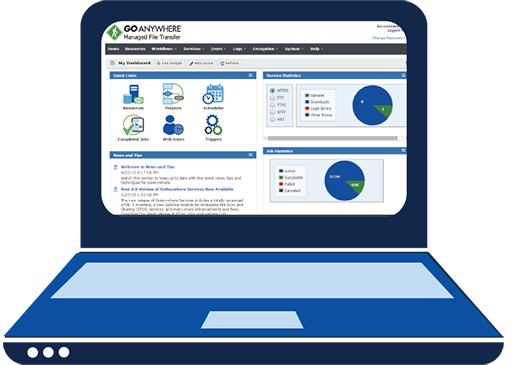 GoAnywhere MFT provides a browser-based interface for configuring and monitoring SFTP, FTPS, and SCP file transfers and workflows for the enterprise. Each administrator can be assigned different roles in GoAnywhere MFT with their own custom dashboards. GoAnywhere MFT can be scaled to meet high volumes of secure FTPS, SFTP and SCP file transfers for the enterprise. The clustering technology allows file transfers and other processes to be distributed across multiple systems for load balancing. GoAnywhere's clustering functionality also provides true "active-active" support for disaster recovery in mission-critical environments. 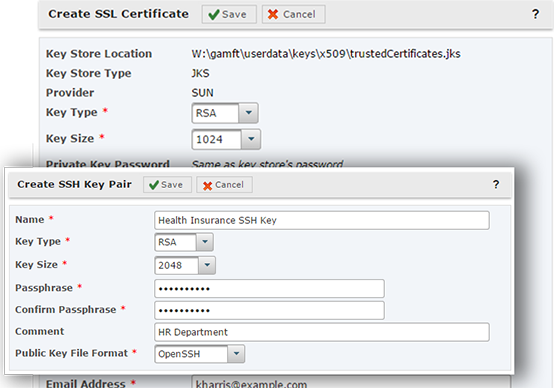 GoAnywhere MFT simplifies keys and certificate management for Secure FTP. GoAnywhere MFT is more than just SFTP. Expand the security, functionality, and flexibility of your solution with a selection of licensable modules. Advanced Workflows: Achieve secure FTP automation. Define how your file transfers and processes are configured. Secure Folders: Grant trading partners and customers access to authorized files and folders. Secure Mail: Send encrypted messages and files through GoAnywhere's web client or Microsoft Outlook. Cloud Connectors: Achieve easy connectivity with popular cloud and web applications like Box and SharePoint. Is it Time to Upgrade to a Secure FTP Solution? Strengthen the security of your data in transit with a secure SFTP, FTPS, or SCP solution. Download a free trial of GoAnywhere MFT to take your next step toward streamlined file transfers.